NASA's newly created Planetary Defense Coordination Office aims to deal with Earth-menacing space rocks. A new NASA organization dedicated to protecting Earth from dangerous asteroids has hit the ground running. In early January, NASA announced the establishment of a Planetary Defense Coordination Office (PDCO), which will synchronize U.S. efforts to deal with threatening near-Earth objects (NEOs) and will supervise all NASA-funded projects to find and characterize asteroids and comets that visit Earth's neighborhood. "Our job is to look for that and identify a NEO as far in advance as we can," Johnson told Space.com in an exclusive interview. "Doing so means we have the maximum amount of time to appropriately deal with the object, be it a small impactor or something that's larger, calling for a kinetic impactor mission, or whatever needs to be done." NASA's Lindley Johnson is head of the space agency's new Planetary Defense Coordination Office. The PDCO is getting right to work. Next month, for example, the organization will conduct an open forum in Vienna, Austria, during a meeting of the United Nation's Scientific and Technical Subcommittee of the Committee on the Peaceful Uses of Outer Space (COPUOS). That UN subcommittee has formalized the International Asteroid Warning Network (IAWN) and a Space Mission Planning Advisory Group (SMPAG) of U.N. member states that have space agencies. "Our intent is to work within the international forums," Johnson said, "and encourage more involvement by other countries." Johnson said that he'll also be working closely with his European Space Agency (ESA) counterparts on NEOs. 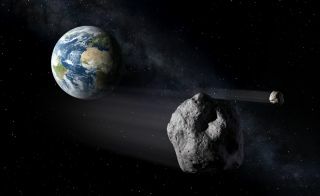 "We congratulate NASA for the establishment of their planetary defense office," said Detlef Koschny, head of the NEO Segment within the Space Situational Awareness Program Office at ESA's European Space Research and Technology Center in Noordwijk, Netherlands. ESA is active in the field of NEOs, Koschny said, citing the NEO Coordination Centre at ESA's European Space Research Institute in Italy. NASA's European colleagues are eager to coordinate on the planetary-defense effort, Koschny's NEO Segment colleague Gerhard Drolshagen told Space.com. "We look forward to working with the new Planetary Defense Coordination Office, building on long-standing international and inter-agency cooperation in the domain of NEO detection, risk assessment and mitigation," Drolshagen said. NASA also recently signed a charter with the U.S. Federal Emergency Management Agency to create a Planetary Impact Emergency Response Working Group, Johnson said. The working group will meet regularly — initially, twice a year, Johnson said — with the goal of bringing more people up to speed on the NEO hazard, and discussing how best to handle a potential impact. The Panoramic Survey Telescope & Rapid Response System (Pan-STARRS) 1 telescope on Mount Haleakala in Maui, Hawaii, made the greatest number of near-Earth object discoveries in the NASA-funded NEO surveys from 2015. By the end of 2016, Johnson said, it should be clear whether ESA will go ahead with the proposed Asteroid Impact & Deflection Assessment mission (AIDA), and whether NASA will be a part of the project. As it's currently envisioned, AIDA would launch two different spacecraft to the binary asteroid system Didymos: Europe's AIM probe and the Double Asteroid Redirection Test (DART) craft, which would be built by the John Hopkins University Applied Physics Laboratory in Laurel, Maryland. DART would slam into the smaller of the two asteroids in the Didymos system, and AIM would observe the results, as a way of gauging the effectiveness of this asteroid-deflection strategy. Another decision expected this year is a go/no-go call on the Near-Earth Object Camera (NEOCam) mission, which NASA selected in September 2015 as a finalist for its next Discovery-class mission. NEOCam would survey the regions of space closest to Earth's orbit, where potentially hazardous asteroids are most likely to be found. Among other duties, the space telescope would assess the present-day risk of NEO impacts. NEOCam is competing with four other mission concepts for a Discovery slot (though it's also possible NASA could pick two of these ideas, officials have said). A decision will likely be announced in September 2016. The Asteroid Impact & Deflection Assessment (AIDA) mission concept study is an international collaboration among ESA, NASA, the German Aerospace Center, France's Observatoire de la Côte d´Azur and the John Hopkins University Applied Physics Laboratory in Maryland. Also this year, the second Asteroid Terrestrial-Impact Last Alert System (ATLAS) telescope is expected to be up and operating. The ATLAS project — developed by the Institute for Astronomy at the University of Hawaii — is designed to spot dangerous asteroids shortly before their final plunge to Earth. The first ATLAS instrument is at work on the Haleakala volcano, on the Hawaiian island of Maui. The second telescope should be operational on the Big Island's Mauna Loa this year, Johnson said. "ATLAS is funded by NASA's NEO Observations Program, which is now integral to the Planetary Defense Coordination Office," he said. "It makes sure nothing on the small end gets through without us knowing about it … at least days to weeks before the impact." Johnson said that he is looking forward to a good year, "finding another 1,500 to 2,000 of these objects with the current capability … and getting a higher percentage of the NEO population in our catalog." Currently, astronomers have identified and tracked nearly 14,000 NEOs, out of a population thought to number in the millions.